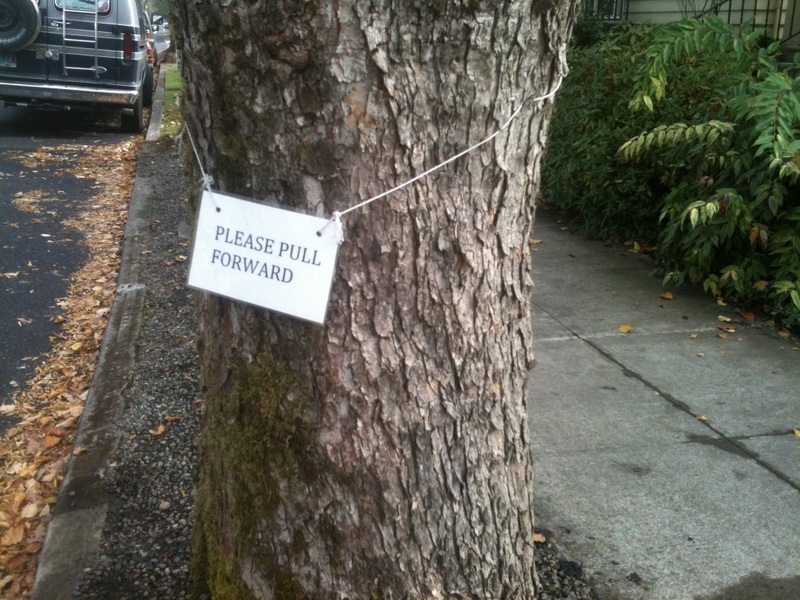 People around here are often polite when offering instructions about certain parking situations. In a couple of signs I’ve seen, please is the lead word and it reminds me that people continue to display good manners. 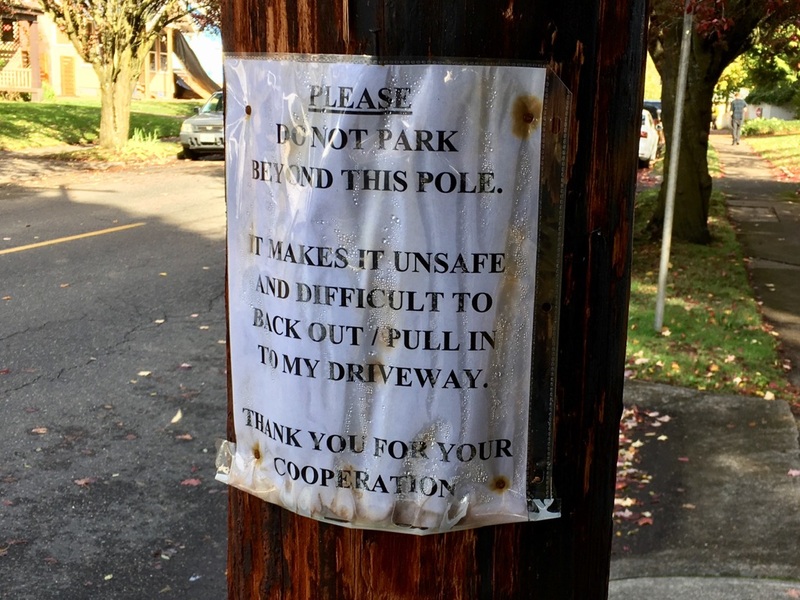 I remember seeing this sign in a neighborhood around Benson High School and being perplexed for a moment about what needed to be pulled forward. The sign? The tree? I suppose it became obvious when I considered that the tree was along the curb and that back bumpers stick out and block driveways. 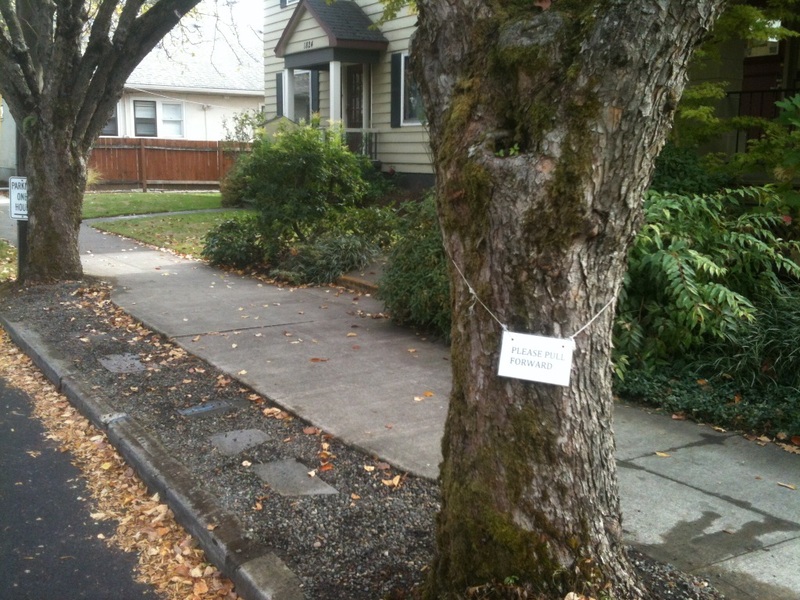 The sign hangs dainty and delicate from the string, but commands your attention. There’s something in the power of block letters and a pleasant font. 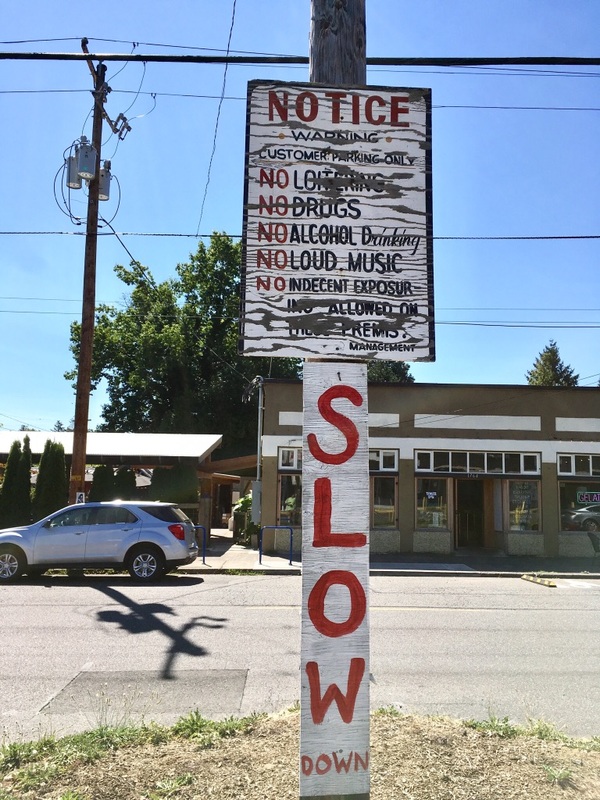 This sign, spotted by the Pioneer School, seems wordy. It’s the kind of sign one passes then wonders about. “What’d that sign say?” Even slowing to a crawl, I’m sure most drivers are focused on carefully parking the car, not reading. Sure you’re going to cooperate if you bother to read the sign. What kind of person would you be if you didn’t? I read all signs, and I hope other people pay attention to them not to mention whether or not they’re blocking someone’s driveway. Also, that pole is an excellent boundary marker. Anything beyond the pole is out of bounds. I’m not critical of the message in any way. It seems perfectly reasonable. On the other hand, I’m sometimes struck by the lengths some signs will go to. Sign makers find reminders of common courtesy necessary at times, and some parse the biblical commandments. There’s not a hint of the word please from this sign spotted in the parking lot of a defunct cluster of stores across from the Tamale Boy restaurant on Dekum St. Bossy, pushy, blaring out it’s “NO” in red ink, the parking lot had a long list of prohibitions as if to discourage people from doing anything but parking in the lot. 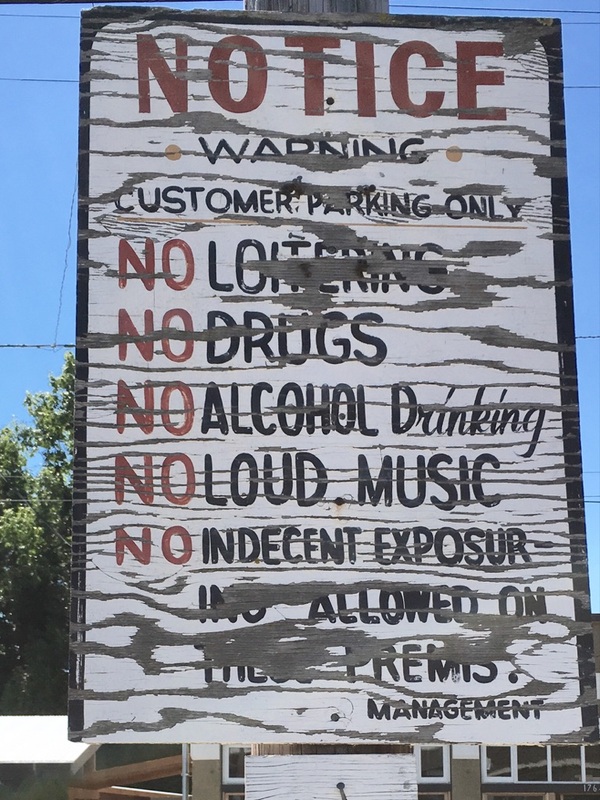 I’m not sure why anyone needs to be reminded not to engage in any “indecent exposur” in a parking lot. And thanks for letting me play music, just not loud music. (You could have included a volume number.) I don’t like rules in my parking lots. There are no rules or even suggestions necessary for me. When I park my car, I’m there to stop driving. I’m there to get out, do some shopping, get back into the car and get out of the parking lot. I would rather loiter and do other things from the list of activities in any other place than a parking lot. If I had a parking lot, there would be no rules allowed except maybe that there shall be no rules or rules signs. Thou shalt post no bills is my commandment! What I really need to do is reread that last part of that sign, slow down and not get riled up about dumb signs in parking lots.